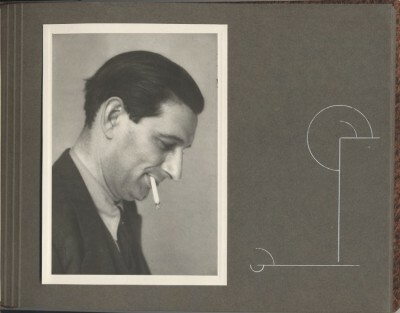 Dr. Joseph Schwartz, March 23, 1941. The Dr. Joseph Joshua Schwartz papers were donated to the Jewish Museum of Maryland by Dr. Schwartz’s niece, Mrs. Samuel Krivitsky, and by his nephew, Rabbi Manuel Poliakoff, as accessions 1982.12 and 1982.16 in 1982, when the Museum was still called the Jewish Historical Society of Maryland. The collection was processed in December 1982 by Rose Cohen and Hattie Lott. 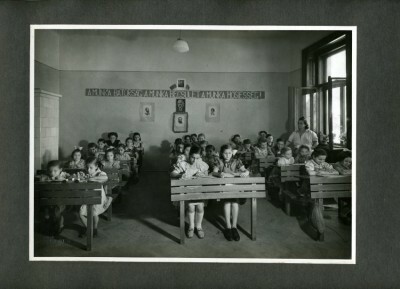 Photo from album presented to Joseph Schwartz “As a token of it’s gratitude the Girl’s Orphanage of the Jewish Women’s Association, Budapest to Dr. J. Schwarz [sic] Chairman of the European Section of the A.J.D.C.”, n.d.
Dr. Joseph Joshua Schwartz (1899-1975) was born in Russia in 1899 and emigrated to the United States with his family in 1907. His father was an orthodox rabbi and young Joseph followed in his father’s footsteps. He was graduated from the Rabbi Isaace Elchanan Seminary in New York City (now Yeshiva University) and served as rabbi at Congregation Pincus Elijah in New York. After receiving his doctorate in Semitics and the Sterling Research Fellowship in Mathematics from Yale University in 1927, he left the rabbinate and turned to teaching Semitic Languages and Literature at the American University in Cairo. He returned to America in 1929 and for the next seven years taught at Long Island University. 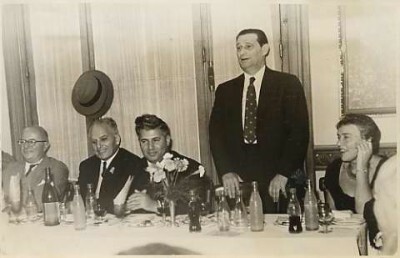 He simultaneously served as Director of Public Information for the Federation of Jewish Charities before becoming the director-general of the American Joint Distribution Committee. He supervised urgent relief and welfare programs during World War II in 30 countries involving more than 1,000,000 people. Mapam’s leaders greeting to his Excellency Minister Shitrit and Dr. Schwartz, 1956. From left to right: Dr. Marcos Satanowsky, his Excellency Minister Shitrit, Mr. Jaime Finkelstein (Leader of the Mapam Party in Argentina), Dr. Joseph Schwartz and Mrs. Schwartz. Dr. Schwartz, as overseas chief of the J.D.C., was instrumental in having more than 100,000 Jewish Displaced Persons emigrate to the United States, Canada and Latin America. He also directed the movement to Israel of more then 500,000 persons from distressed areas in Europe, North Africa and the Middle East. Dr. Schwartz was cited by many institutions and organizations for his scholarship and humanitarianism. He held honorary degrees from Yeshiva University and Brandeis, as well as from Dropsie College. For his work on behalf of refugees he was awarded Legion of Honor of France and was decorated by Poland and Hungary. Dr. Schwartz died in 1975 at the age of 75. He was married to the former Dora Rashback and was survived by his son, Nathan. 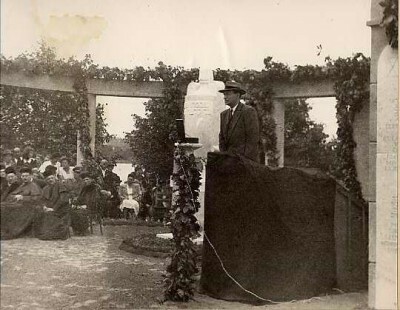 Dr. Joseph Schwartz speaking at a commemoration in Kaposvar, July 6, 1947. On this site a monument was erected to immortalize the memory of 7000 Jewish martyrs of Kaposvar and Somogy County who were deported and killed. 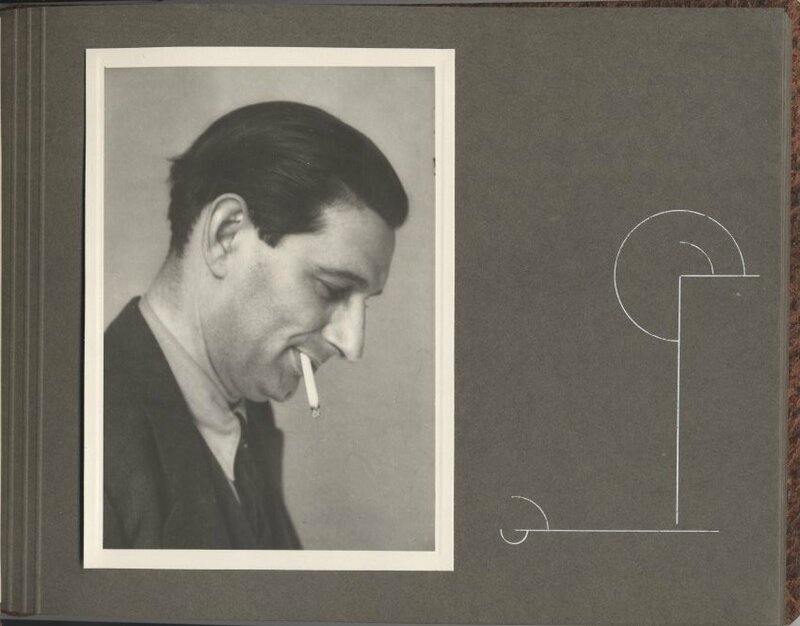 Dr. Schwartz’s papers consist primarily of clippings, printed material and his scholarly research notes. There are some clippings about his work with the Joint Distribution Committee in the 1940s but most relate to his tours of Mexico and Argentina in 1956 and of Montevideo in 1961. There are official photograph albums of these two tours among the photographs of the collection. The printed material is largely programs and invitations to functions honoring Schwartz for his work. There are also some publications about Israel and the Paul Baerwald School of Social work, which offered a program named in Schwartz’s honor. 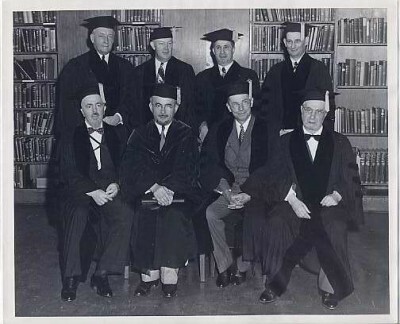 Dr. Joseph Schwartz, back right, and other men in academic regalia, n.d.
Dr. Schwartz’s academic career is represented by his research notes in Hebrew and Arabic and by copies of two published articles. There is a file of material on his personal library, which was given to Kent State University. The collection includes a small file on Joseph Schwartz’s father, Abraham Nachman Schwartz, who was rabbi of the Congregation Shomrei Mishmeres in Baltimore. The material incudes his obituary and some biographical data supplied for use by the Encyclopedia Talmudit. Nathan Schwartz was Joseph Schwartz’s son. He is a musician and the records in this collection relate largely to his musical training and early career in the late 1940s and early 1950s. 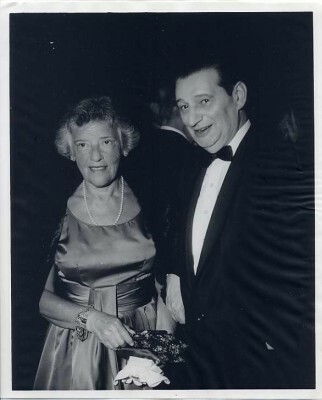 Dr. Joseph Schwartz and his wife Dora. The Louis J. Fox Papers were found in the collection of the Jewish Museum of Maryland in July 2004 without an accession number; having been referred to since its arrival as MS 5. Unable to reconcile the collection with an existing accession, it has been assigned accession number 2004.55. Anne Turkos, Vella Beckman and Elva Schneider processed the collection in October 1982. Erin Titter updated and revised the finding aid and box list in July 2004. Access to the collection is unrestricted and is available to researchers at the Jewish Museum of Maryland – contact Joanna Church, collections manager, jchurch@jewishmuseummd.org to make a research appointment. Researchers must obtain the written permission of the Jewish Museum of Maryland before publishing quotations from materials in the collection. Papers may be copied in accordance with the library’s usual procedures. Louis J. Fox was born in Baltimore on June 8, 1911. He graduated from Baltimore City College High School in 1929 and for a short time thereafter worked in the insurance industry and the scrap metal industry. In 1931, Louis and his brother Robert opened Fox Chevrolet in Baltimore. On September 11, 1933, he married Dorothy Newman and they had two daughters, Jill Fox and Shirley (Fox) Scholder. Jill died in the 1950s and her parents founded the Jill Fox Memorial Fund in her honor. 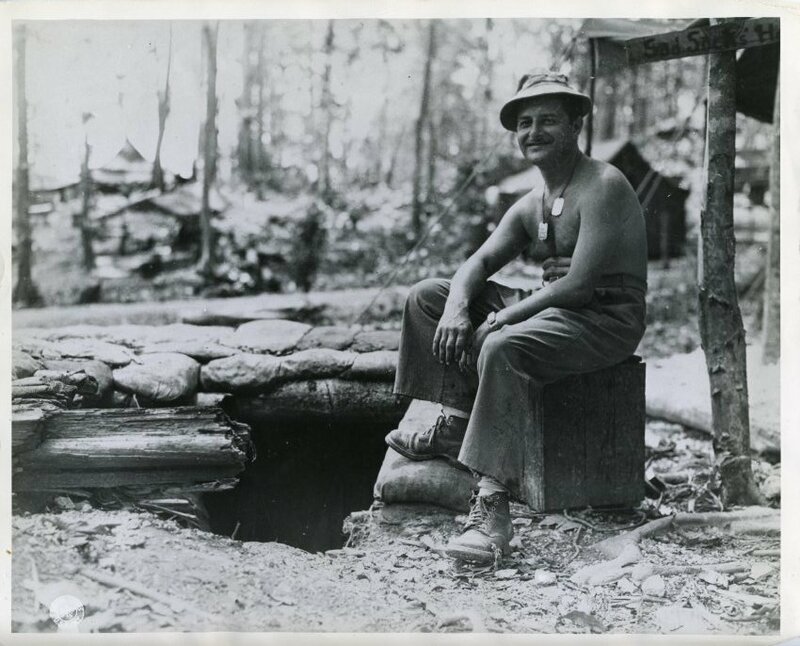 In 1944, Louis Fox entered the Army as a Radio Repairman, Aircraft Equipment and achieved the rank of sergeant. He was discharged in 1946 and he returned to Baltimore to work at his car dealership. In 1958 he bought out his brother Robert and subsequently expanded the business to several area locations and began selling other brands. He served as company president and was named chairman in 1972, a post that he occupied until his death. Louis Fox was active in several local and national organizations. 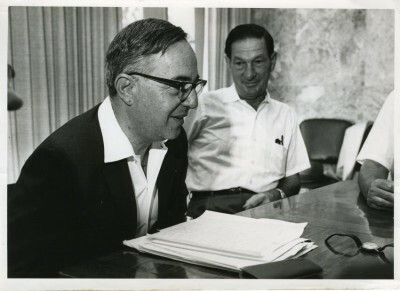 He was president of the Jewish Welfare Fund in the 1950s, the Associated Jewish Charities in 1965 and 1966, and the Council of Jewish Federations in 1966, 1967, and 1968. He was president at Baltimore Hebrew Congregation and was the first president of its Parents’ Association. He was also on the executive board of the Union of American Hebrew Congregations, and was director of the University of Baltimore, Sinai Hospital, and South Baltimore General Hospital, now the Harbor Hospital Center. He was the first president of the Jewish Community Center, a regional chairman for the national Conference of Christians and Jews, and was a founder of the Jewish Historical Society of Maryland, now the Jewish Museum of Maryland. He died on February 25, 1995 at Sinai Hospital of heart failure. The Louis J. Fox Papers contain both personal papers and those related to the many organizations with which he was involved. 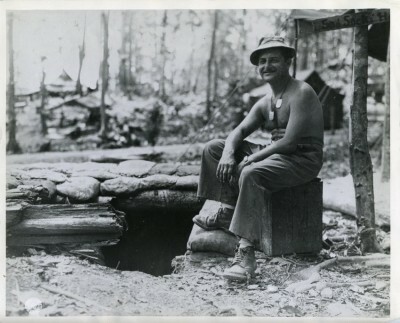 Personal papers include military records, awards, newspaper clippings, and correspondence he received for his accomplishments. Organizational papers consist primarily of official correspondence from the Jill Fox Memorial Fund, the Council of Jewish Federations, the Anti-Defamation League, the Legacy and Endowment Fund, State of Israel Bonds, and the Jewish Deaf Society, and from his involvement with Soviet Jewry. These papers are organized alphabetically by the name of the group or organization. The Kraus Family Papers were found in the collection of the Jewish Museum of Maryland in May 2003 without an accession number. Unable to reconcile the collection with an existing accession, it has been assigned accession number 2003.053. Erin Titter processed the collection in May 2003. The Kraus family and its ancestors lived in the Fells Point section of Baltimore in the mid to late nineteenth century. In 1851, William Floss purchased property near the corner of Bank and Bethel Streets in Fells Point. 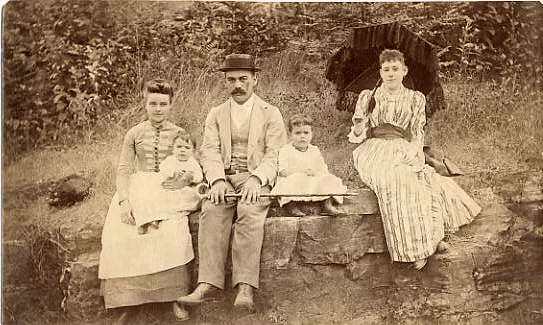 William Floss married Sarah (d. c.1873) and they had two children, Simon W. and Hellen. Simon W. Floss married a woman named Emma. Hellen (d. c.1895) married Henry Adler. Hellen and Henry are buried in Baltimore Hebrew Congregation Cemetery. Simon and Emma did not have children as of March 26, 1887. Henry and Hellen had at least two children, Sara F. and Gertrude B., although they may have had a third, Mattie, who died as a child. 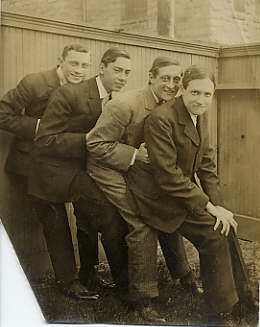 Gertrude B. Adler married George W. Kraus and they had at least three daughters, Hellen, Edna, and Mabel. It remains unclear how the Korte family is related to the Kraus family, but it appears that Matilda and Frederick Korte were at least good friends of Henry and Hellen Adler. The Kraus Family Papers contain documents from three generations of the Kraus family, which lived in the Fells Point section of Baltimore. The bulk of the records are deeds, mortgages, wills, and other probate records, however personal letters, certificates, and report cards from Western High School are also included in the collection. Through these records, one can piece together a general family tree of the three generations included in this collection. Also of interest are the personal letters written to Matilda Korte from her husband Frederick while fighting with the Union Army near Bermuda Hundreds during a failed attempt to march on Richmond in 1864. Series I. Personal Papers, n.d., 1836-1971 includes all letters, certificates, wills, mortgages, deeds, report cards, and citations. Folders are organized alphabetically by the last name of the individual. Series II. 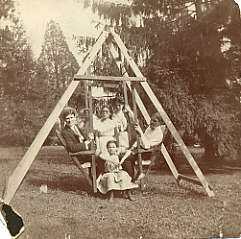 Photographs, n.d. includes all photographs previously known as PC 7, Reverend Leopold Kraus Family Photographs. Like the papers, these photographs were found in the collection without an accession number. Recognizing that the photographs are an extension of the papers, they received the same accession number as the papers. Most of the photographs are unidentified. Folder titles were left the same as was the order. 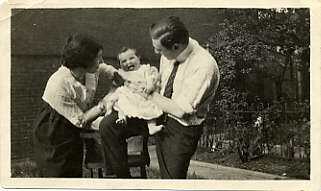 I have added the generic title “Family Photographs” whenever another title was not provided. Dates, where given, were estimates provided on the previous folder headings.